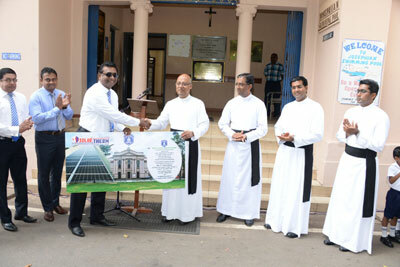 St. Joseph’s College, Colombo 10, inaugurated the first phase of a Solar Power Generation Project on March 27 at a simple ceremony held at the College premises in the presence of Rector Rev. Fr. Travis Gabriel. The 60KW solar energy plant marks the beginning of the school’s switch to renewable energy, while resulting in reduction of approximately one third of its electricity usage from the National Grid. The Project Committee followed a very stringent process in selecting Solar Therm as their energy partner. This is yet another project initiated and carried out by the Jaela-Wattala branch of St. Joseph’s College OBU, who have also contributed to the college with other projects such as the modernization of the school dental clinic and instalation of a digital cricket scoreboard.